A totally unique and innovative concept in Hot Chocolate preparation. La Chocolatière, for making that perfect cup of drinking chocolate. Use real chocolate flakes or instant powder, for delicious frothy drinking chocolate, hot or cold. 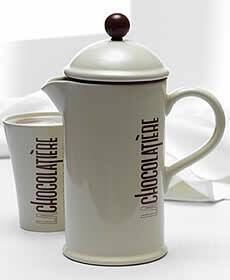 Ceramic pot available in 1 ltr size, with integral frother. Produced in high quality ceramic, with a special filter for making that thick and frothy drink, this makes the perfect cosy night in.